Symfony is a web application framework written in PHP. Its provides a set of reusable PHP components. Symfony 3 is the latest version available of this releases. Currently it is providing 30 stand-alone components for your applications. 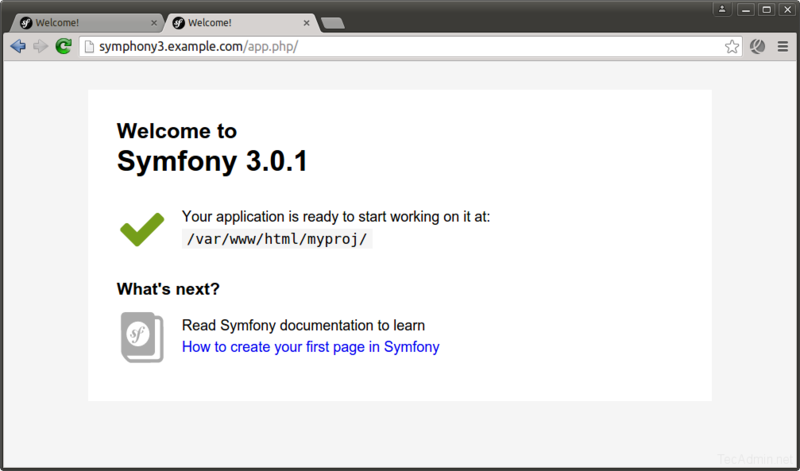 This tutorial will help you to install Symfony 3 php framework on Ubuntu, Debian and LinuxMint operating systems. First start with the installation of LAMP server on your system. If you have already running LAMP stack skip this step else use followings commands to set up lamp on Ubuntu system. Symfony provides its own installer for creating new projects. Below commands will help you to setup Symfony installer on your system. After successful setup of Symfony installer on your system. Let’s start with your new Symfony application. Navigate to your web document root and create a new Symfony application. Now change to newly created directory and check if all requirements are properly installed on your system. If everything is fine you will get following results. Now start development with Symfony php framework and built great application’s. To view changes in browser you can start Symfony developer web server using following command. By default web server will start on port 8000. Now access http://localhost:8000 in web browser. Now If you need to configure Symfony with sub domain. Create a new Apache configuration file under directory /etc/apache2/sites-available/ and add Virtual Host for your Symfony 3 application. directory and add below content. Finally enable website and reload Apache service using below command. Click here to read more about Symfony framework.